Bright and early this 100th morning before the primary, Roll Call has an assessment of the CD8 race. If you didn’t know better, you’d think there were only two candidates running. 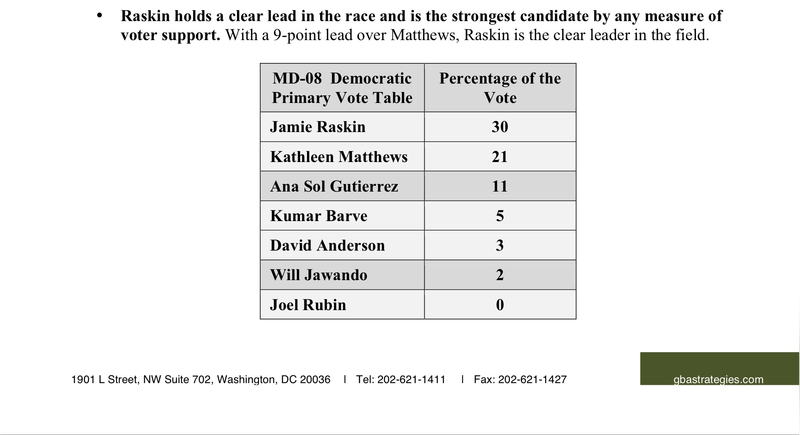 Even if you believe that Jamie Raskin or Kathleen Matthews is likely to win (which you should believe at this point), I suspect you’d also want to know what impact the other five candidates might have on the two frontrunners. You won’t get any such analysis from the Roll Call piece. What you will get is a pretty good take on the approaches of Matthews and Raskin. 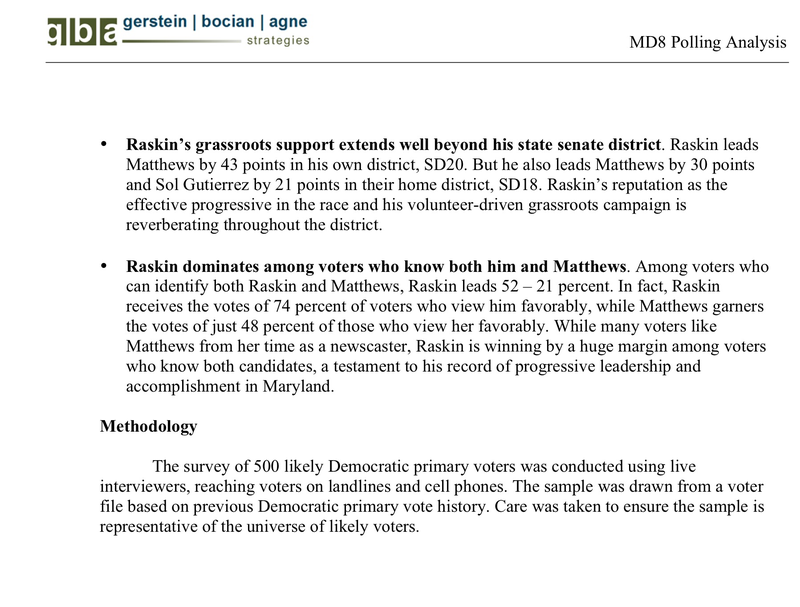 At this moment, it’s hard to argue that Raskin doesn’t have the better voter outreach (a point the author completely misses), but as he does note, Matthews is gearing up while Raskin is slowing down – at least his own personal campaign activity – because from now until April 11 (three days before early voting starts and fifteen days before the primary) Raskin will be in Annapolis for 8-10 hours a day, four days per week (and more as session draws to a close in late March and early April). For about four days a week, from now until April 11, a major obstacle will be out of Democrat Kathleen Matthews’ way as she runs for her party’s nomination in Maryland’s 8th District, a primary contest that could well decide the successor to outgoing Rep. Chris Van Hollen. That is because state Sen. Jamie Raskin – the Democrat who polling and Maryland Democratic operatives say is her chief rival among six others running for this open seat – will be spending more and more time in Annapolis during the 90-day legislative session that ends only two weeks before election day. During the legislative session, Raskin said he has “turned down a lot of smaller bills” this session to focus on his campaign and on issues of larger policy consequence, particularly one that would prevent terror suspects from purchasing firearms in Maryland and another that would require the use of ignition interlock devices in all cases of drunk driving. With her opponent partially off the field, Matthews said she plans to spend every free minute of her own free time connecting with voters — and then some. On Saturday, she re-launched a door-to-door operation, starting in voter-rich Bethesda, with just 101 days until primary day. The district, which Van Hollen is vacating to run for an open Senate seat, runs from Montgomery County’s border with D.C. north to the Pennsylvania line. How well will the early Raskin organization hold up while its candidate is off in Annapolis for three months? 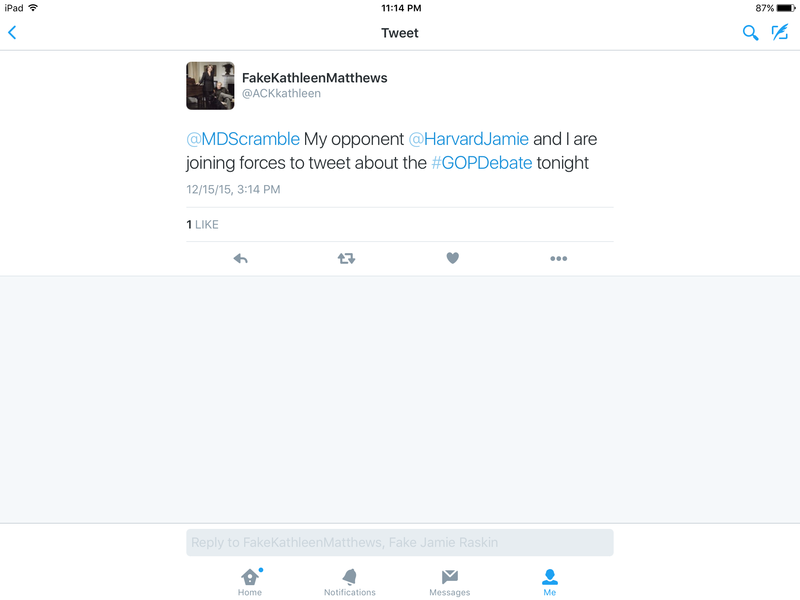 How diligent and effective will Matthews be in her winter campaign? Raskin has touted his “grassroots” connections and organization from the outset, and there’s no question that he’s reached a lot of voters. Matthews has to prove that she’s up to the task of countering that outreach, if not voter for voter, then at least sufficiently for her to bring her financial advantages to bear in direct mail and particularly television ads. What role will money play in the end? Matthews already has a $200,000 advantage in cash on hand, and that’s likely to grow. While money might not be able to buy you love, it can help reach a lot of voters in a short time, particularly in a congressional race in a presidential election year. Finally, there’s another duel playing out that doesn’t always get noticed in the contrast of the two leading candidates: Annapolis versus Washington. Roll Call highlights the contrasts. In his view, that “proven” record is why he has earned the endorsements of prominent county leaders and many of his fellow state legislators. No one from the state’s congressional delegation has endorsed anyone in the race. * Matthews, meanwhile, has secured support from national groups, including EMILY’s List, as well as a number of federal lawmakers. In her campaign’s fundraising report, which will be released at the end of the month, Matthews said she has received contributions from California Sen. Barbara Boxer and Missouri Sen. Claire McCaskill. Raskin said his time in Annapolis over the next several weeks will say something, too. * This is incorrect. 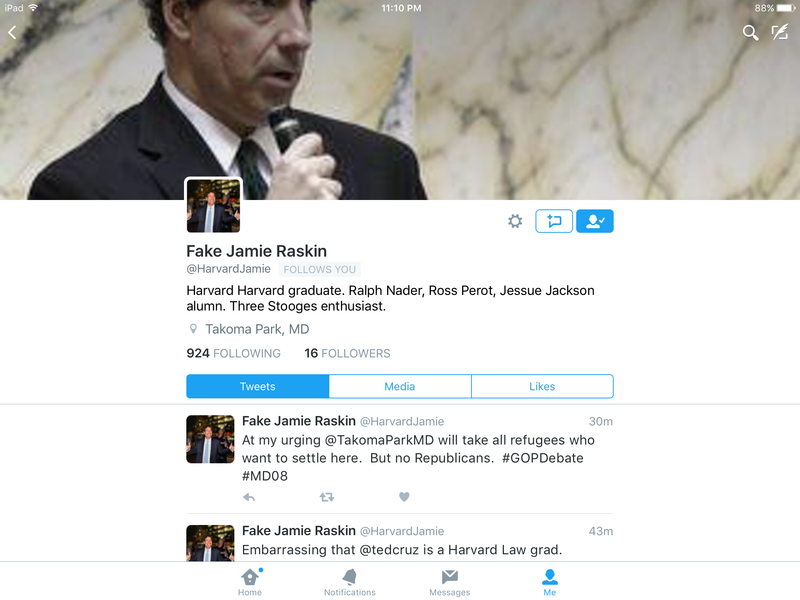 CD3 Congressman john Sarbanes has endorsed Raskin, his former Harvard Law School classmate. None of these debates are unique to CD8 – what makes this so interesting is that there are so many interesting duels all unfolding in one congressional race. In 100 days, we’ll know the answers, but I’m looking forward to seeing the different fault lines play out from now until April 26. Overheard at Busboys and Poets in Takoma (aka “the beating heart of the radical Takoma Park syndicate”) this morning . . .
confirming the two recent statements by Takoma Park’s own Vladimir I. Lenin, construction on the wall creating Maryland’s new Ninth Congressional District will begin in the next several weeks. “CD9” is the week’s trending hip phrase now. Why? Because I said so, and I’m the Snarkster in Chief. Somebody better get the noted witch hunter Barry O’Connell on the case before this gets out of hand. We have some new Twitter action in CD8. Totally fake, but also very funny so far. FYI: the “ACK” in “ACKkathleen” is the airport code for Nantucket. I had to look it up. 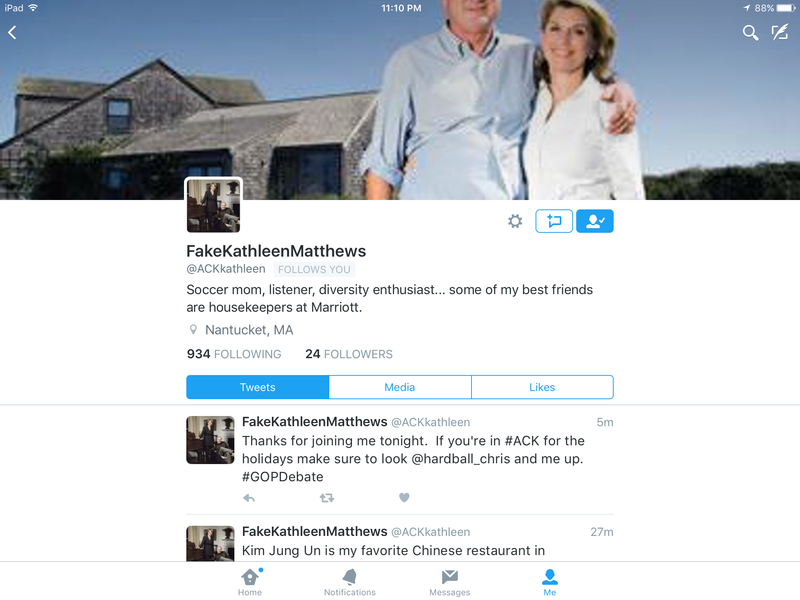 Even cooler than two fake Twitter accounts, I got my very own fake tweet from fake Kathleen Matthews. I’ve made the fake big time! Can be watched here. I usually try to embed these but it didn’t work quite right this time. So I’ll give you a photo instead. There are around 200 people packing the room tonight. Impressive turnout. The candidates and the super PAC have been boating away at each other all afternoon. John Fritze in the Sun assesses the impact of the Mayday super PAC ad on behalf of Jamie Raskin in CD8. 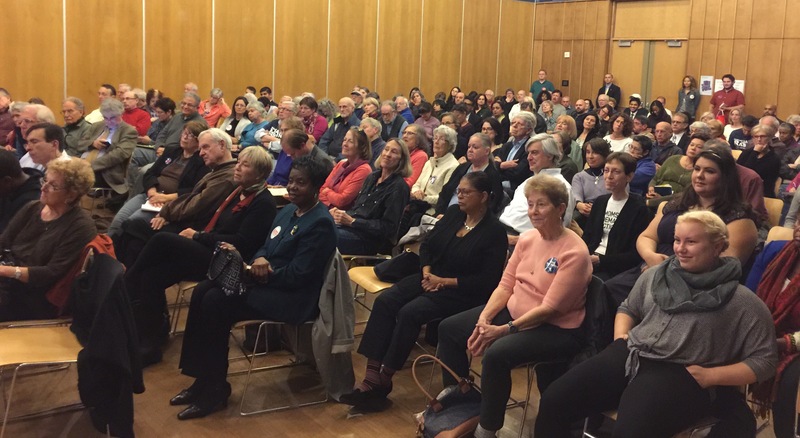 Noting Raskin’s record on campaign finance as a member of the state legislature, Mayday PAC held an event in Takoma Park on Monday to back his candidacy. The group was founded as a “super PAC to end all super PACs,” supporting candidates who embrace changes to campaign funding. Matthews was never a registered lobbyist for Marriott. The former WJLA-TV reporter and anchor did oversee the division at the Bethesda-based company that handled both communications and government affairs. 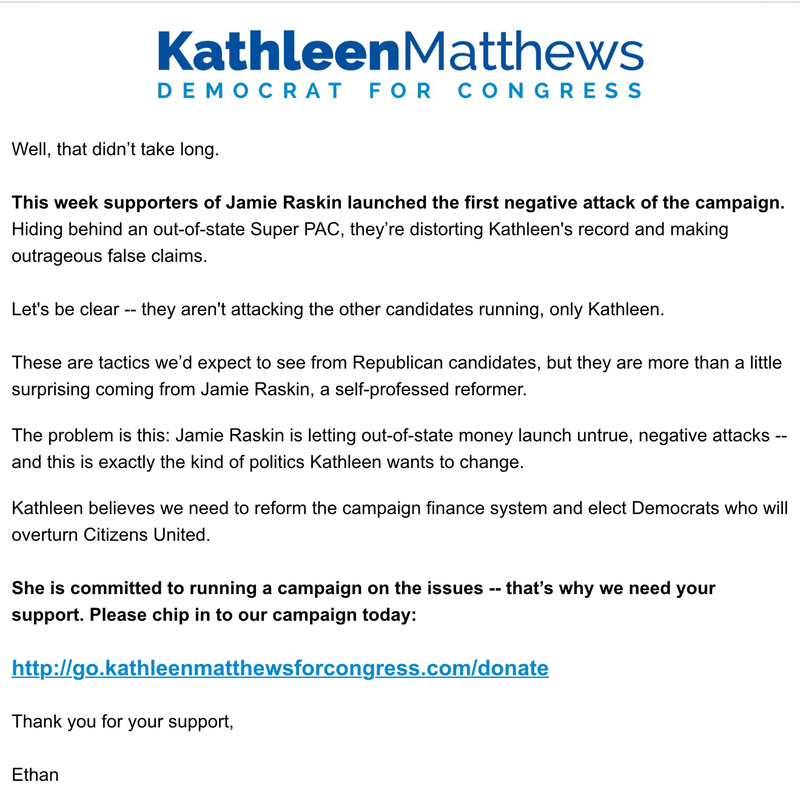 Matthews’ email to supporters focuses its ire at Raskin but, by law, super PACs operate independently of the campaigns they are supporting. Another proof Raskin wasn’t coordinating his message with the PAC: His camp was trying to pitch a story about a different endorsement — that of Montgomery County Del. Kathleen M. Dumais — to reporters on the same day. 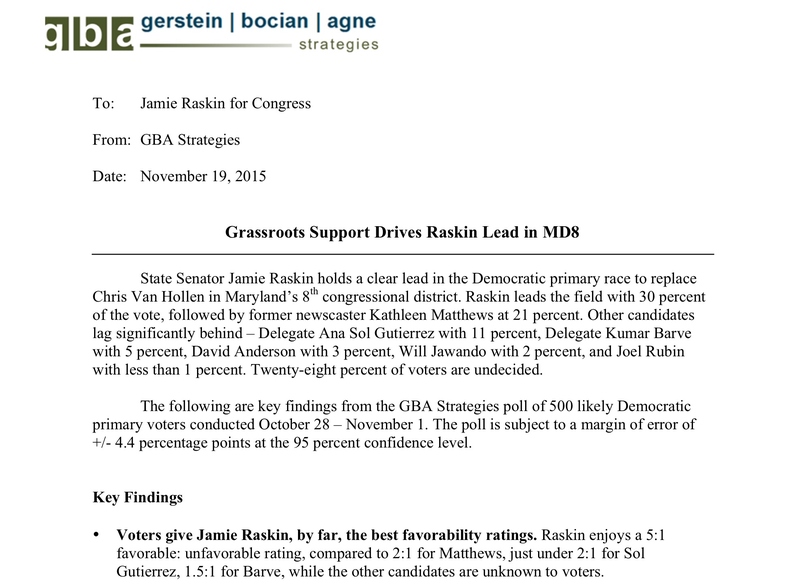 The Raskin campaign blasted right back. Raskin’s campaign said it was not involved with the attacks. The back-and-forth represents a break from the mostly genteel tone that has dominated the 8th District race so far — and it underscores the impact outside groups can have, even in primary elections. 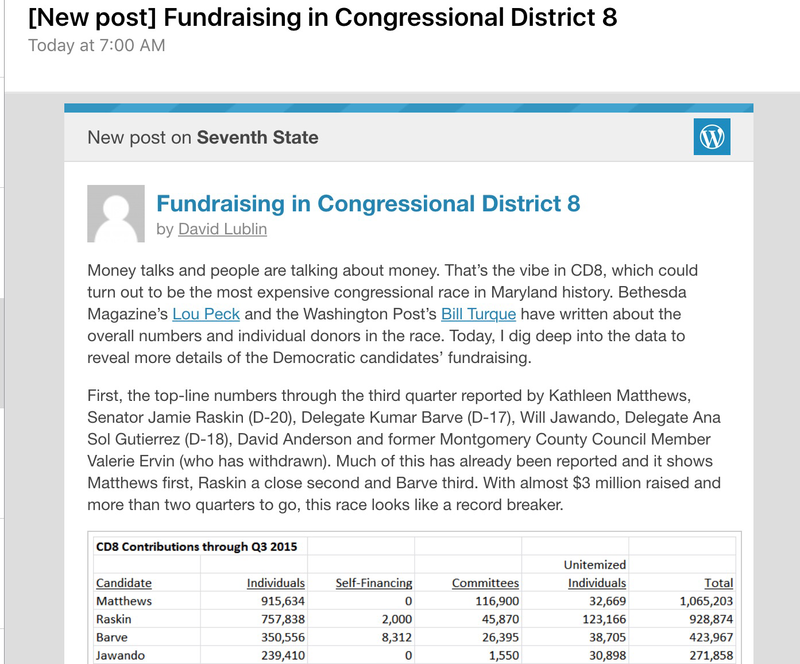 Mayday raised $11 million in the 2014 cycle, and it has committed to raising at least $100,000 for Raskin. Yesterday I wrote about Mayday, the campaign finance reform super PAC. Today, they’ve come riding into CD8 with an ad for Jamie Raskin, an ad which also attacks Kathleen Matthews repeatedly by name. I said it yesterday and I’ll say it again. No good will come to Raskin from this clueless group. Even before I saw the video, Matthews has issued a response, an email from campaign manager Ethan Susseles calling out Raskin for a “negative attack” and seeking support. Look, the fact is that money is money. A dollar from Maryland spends no better than a dollar from Wisconsin. And Raskin’s argument isn’t that Matthews’ money is tainted by who it’s from, only where – as we say down in Texas, “it ain’t from around these parts.” That argument is way too subtle for anyone not already in the tank for Jamie to care about. Not to mention, when the guy with the good government halo over his head strikes the first negative blow, that’s not going to sit well with many people. Following it up with a super PAC making the attack explicit is even more risky. We’ll see how it shakes out in the end.